As the Founder of Rethink Press, one of the fastest growing hybrid publishers of business books in the UK, Lucy is often asked to speak about writing and publishing to a variety of audiences. In her role of Global Publish Mentor for Dent Global (Key Person of Influence), she gives keynotes to audiences of 400+ and facilitates master classes for groups from 10 to 70 delegates. Lucy is the Founder and face of the Business Book Awards, so addresses authors, publishers and awards judges at a range of events, including the glittering Awards Event dinner attended by over 200 authors, publishers and business people. Since starting her first publishing company while she was still at university, Lucy has been a magazine and book editor and publisher, print and screen journalist and presenter, TV script-writer, editor and producer. As Director of Development at Lifetime Productions, she created and wrote the children’s TV series Runaway Bay, starring Naomie Harris, and Go Wild! with Chris Packham. As an international work-life balance expert, Lucy has given keynotes, reports and workshops for clients ranging from multinationals such as Virgin, Microsoft, Linklaters, Lloyds and BP, Department for Transport, All Party Parliamentary Groups, European Union research groups, Leeds City Council and the NHS. 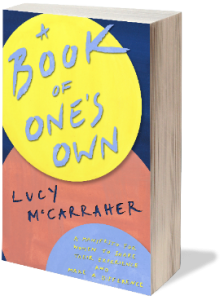 A Book of One’s Own – a manifesto for women to share their expertise and make a difference is published in March 2019. Written with the input of 50 women authors of business books, Lucy makes the case that more women need to write their book to raise their authority as business owners and entrepreneurs, and increase respect for women more widely. Lucy has a post-graduate diploma (DTLLS) in teaching Creative Writing and Adult Literacy, and was nominated for the prestigious NatWest Women in Business Awards in 2017. She has adopted two daughters from Russia, one of whom has Foetal Alcohol Spectrum Disorder, and is the Chair of Trustees of a young people’s educational charity. The 10 Archetypes Women need to know to achieve their goals. Dare to write your book (even when you don’t feel ready). Write and Publish the Book that will Transform your Business & Professional Life.